After analyzing the data and studying best-practice organizations, we have our answer and it’s an indisputable—Yes. 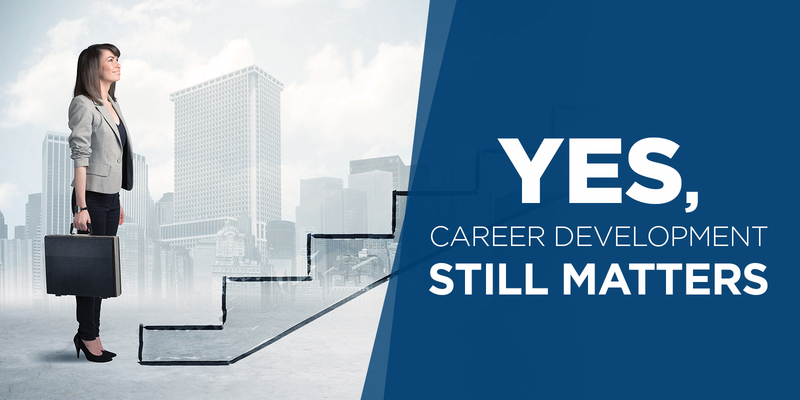 Career development is not only still relevant but is arguably more relevant than ever. Why? Skills and competencies are becoming obsolete at a quickening pace. Employees see continuous growth and development as essential to staying employed. Employers are looking to career development as a means to lengthen employee tenure and secure the cutting-edge capabilities their business plans require. Rather than turning away from career development, the best-practice organizations that we studied are leveling up the sophistication of their career path tools and then supporting these tools with personalized coaching and career workshops. Through these efforts they are integrating organizational priorities with employee needs. Here are three ways that best-practice organizations are keeping career development relevant for both the business and employees. Career lattices— Some organizations, especially those with limited management positions, now use “career lattices” that reveal lateral moves that can broaden an employee’s skill sets; employees see opportunities to gain new experiences through rotational or temporary assignments, for example. Career coaches—Best-practice organizations are supplementing career lattices and other types of career maps with formal career guidance workshops and coaching. These are opportunities to personalize development plans and integrate them with the organization’s available learning and development resources. In fact, many best-practice organizations leverage certified career coaches and development advisors rather than direct managers to ensure employees feel free to candidly discuss their goals and to expose each employee to all options available, beyond the most immediate lines of succession. Virtual career centers—Virtual career centers provide tools and resources to help employees manage and plan their careers. They contain information on skills that will be critical to the organization’s future, training and development offerings, career opportunities, career programs and services, and career success stories and testimonials. Recently, I wrote about how SAS integrates career maps, workshops, and coaching with learning and development programs so that employees can make smart decisions about their future—while supporting the future of SAS. Read about these efforts in my AMA Playbook article: A Fresh Take on Career Development in Our Changing Business Environment. APQC members can learn more about how SAS and other best-practice organizations are keeping career development relevant in our Training and Development Content Collection.